The Electoral Commission has referred Arron Banks to the National Crime Agency for suspected false declaration of the source of EU Referendum funding. The alleged offence involved £2.9m of money given by Mr Banks and spent by Leave.EU, the UKIP campaign for Leaving the EU - the official campaign was Vote Leave and is not implicated in the Electoral Commission accusations. Mr Banks' donation has been covered in the media as £8m rather than £2.9m. £8m was indeed donated but only £2.9m was spent owing to the rules for spending limits. Across all campaign groups Remain spent £19.3m and Leave spent £13.3m. What is worrying about these "charges" is that Foreign Remain contributors funnelled large sums of money through UK subsidiaries and this has not been questioned by the Electoral Commission or the Media. The start-up funding for the Stronger In campaign was provided by Goldman Sachs, the US Investment Bank. Other US Investment Banks such as JP Morgan (Where Tony Blair is £2m a year International Director), Citigroup and Morgan Stanley also contributed large sums. Irish RyanAir, French Eurostar and Airbus and the huge US comms company Liberty Global also backed Stronger In. Click on the links above, the foreign contributions are all clearly documented but the Media are being strangely quiet about it. What is worse, using an Isle of Man company or a UK subsidiary to massage foreign funding into the Referendum? 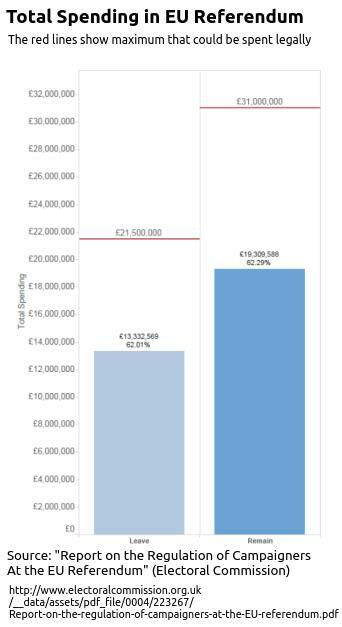 The accounts of the Stronger In Campaign - the official Remain Campaign - to the 31st August 2016 show £19.6m of spending on the referendum but only £6.7m of this is recorded by the Electoral Commission as being spent on the Referendum. There can be no doubt that the timing of when donations had to be declared and the wording of the rules for the Referendum campaign were designed to benefit the Remain campaign massively. If we just add the Government spending on pro-EU leaflets and the Stronger In accounts figures to Remain spending it is clear that Remain outspent Leave by perhaps £20m over the whole, real, Referendum period. It is very worrying that the campaigns by the EU to reverse the Irish referendums used exactly the same technique of smearing major contributors for instance by using "..a whispering campaign in the US media suggesting that Ganley is being funded by arms dealers in the US linked to the US military." (See EU Second Referendums). Why are UK journalists failing to draw parallels between the UK and Irish experience and failing to expose the huge Remain foreign contributions? Also see Who is paying for The Peoples Vote? and The Funding of the Stronger In Campaign. Previous We need to talk about China.